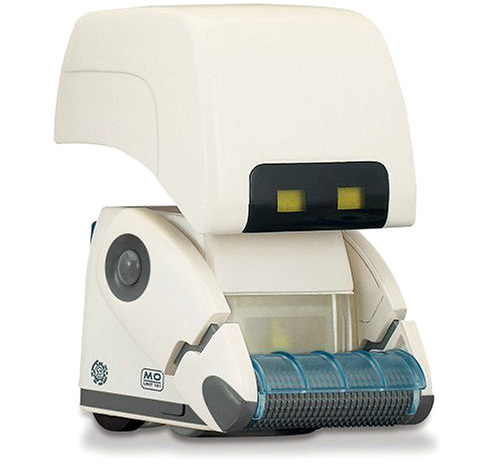 WALL-E's M-O Coming To A Crumb Covered Desk Near You | OhGizmo! OhGizmo! Giveaway – Uncharted 2: Among Thieves Beta Extended! He may not be the poster bot for the film, but M-O, aka Micro Obliterator’s quiet antics in WALL-E made him instantly likable. And not only did he do a good job at keeping the Axiom clean, but even with just a set of glowing eyes he had loads more personality than the most advanced Roomba. So for that reason alone this M-O deluxe action figure would make a great addition to any desk. But what’s with the deluxe you might ask? Well it turns out M-O actually has a set of duel bristles on the front allowing him to sweep up any dust or crumbs you roll him over, which are collected in an easy to empty waste bin on his back. Let’s see an Eve figure do that! $21.99 from Amazon. ← OhGizmo! Giveaway – Uncharted 2: Among Thieves Beta Extended!